This volume offers a coherent analysis of the European Union’s security strategies within a comparative framework. If the EU is to survive and prosper as an effective security actor, it requires that greater attention be devoted to taking a cohesive and common position on the relationship between EU foreign policy means and goals. The major claim of this edited collection is that there is a European grand security strategy that disciplines member state security strategies. That grand strategy has two distinct substantive goals: (1) the preservation and expansion of the EU system of security governance; and (2) the implementation of specific strategies to meet internal and external threats and sources of insecurity. The EU has sought to develop a grand security strategy that not only accounts for the proliferation of threats possessing a military or non-military character and differentiates between core and peripheral regions of interest, but also addresses the requirements to bridge the increasingly blurred boundary between internal and external security threats and the necessary reconciliation of the competing security preferences of its member states. The empirical contributions to this volume examine the EU security strategies for specific issue areas and regional threat complexes. 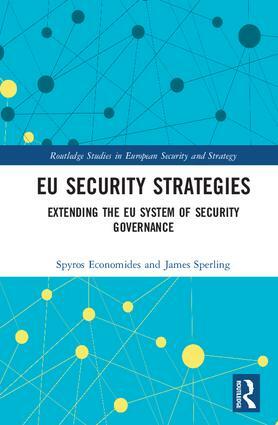 These case studies assess whether and how those strategies have consolidated or expanded the EU system of security governance, as well as their successes and limitations in meeting the security threats confronting the EU and its member-states. This volume will be of great interest to students of EU policy, foreign policy, security studies and IR. Spyros Economides is Associate Professor of International Relations and European Politics at the London School of Economics and Political Science, UK. James Sperling is Professor of Political Science at the University of Akron, Ohio, USA, and editor of The Handbook on Governance and Security (2014). The aim of this series is to bring together the key experts on European security from the academic and policy worlds, and assess the state of play of the EU as an international security actor. The series explores the EU, and its member states, security policy and practices in a changing global and regional context. While the focus is on the politico-military dimension, security is put in the context of the holistic approach advocated by the EU.